Ideal gift for the fashion conscious. 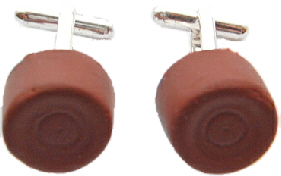 Straight from the catwalk, this trendsetting cufflinks is this seasons must have accessory. Made from shaped polymer clay into this pair of lovely silver plated cufflinks comes in a free gift pouch. Due to the handmade nature of these products, styles and sizes might vary slightly.